During the implementation of complex tasks involving a fight with a simulated enemy surface ship, the crew of the flagship of the Caspian Flotilla — rocket ship "Tatarstan" April 25 cruise missiles successfully hit the target for the marine site in the Caspian Sea. As the press service of the Southern Military District, rocket shooting done in two anti-ship cruise missiles (ASM) X-35 type of quad launchers for shipborne missile system "Uranus". 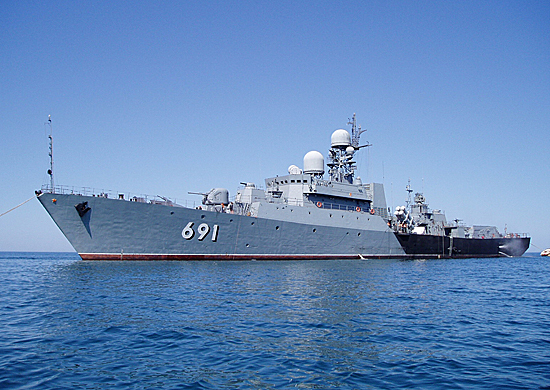 Surface ship was struck by a simulated enemy anti-ship missiles at ranges greater than 100 km. Simulated enemy specially designed for this purpose towed the ship's shield target. Marine ground total area of 2600 square meters. km, where the exercise took place, was closed to civilian shipping. Tasks performed on the closure of the landfill about 20 surface ships and support vessels of the Caspian Flotilla.